It seems like the last few weeks have disappeared quickly. 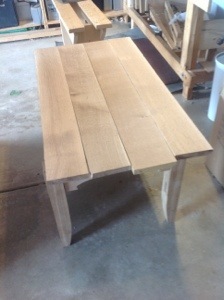 Between a busy work schedule and some family commitments the coffee table sat quietly on the bench. 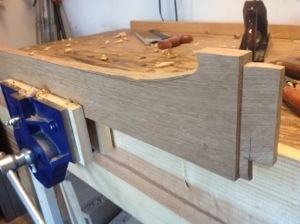 After completing the arches on the sides of the chest I realized that using a flat rather than curved spokeshave would increase my control. Searching eBay and local sources I came up empty and turned to Lee Valley Tools for a new Veritas spoke shave. Returning to my bench the new tool made a world of difference. It handle the curves better and with the flat face it did not have the tendency to chatter. 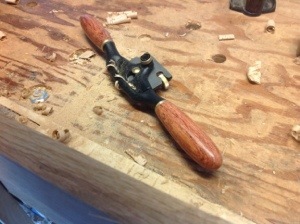 If you have never read woodworksbyjohn.com go over and give the site a look. John asked me a question about my method for making the arches with a chisel. His method would be a coping saw. I tried this on one of the arches and apart from my poor sawing skills it worked well. Although I think I prefer the chisel method. With the arches complete I took a few minutes to sort the stock for the table top. After swapping boards around multiple times I finally came up with the layout milled the rest of the lumber for the shelf. Arches are looking good! I used to teach woodshop to 6-8 graders and my goal was to teach them how to do decent work with the minimum amount of cash outlay. Coping saw and file filled that requirement!